A strong partnership working together to ensure continuous professional development of its members for the ultimate goal of providing the very best teachers and leaders for students in the region. Congratulations to Mr. Michael Freeman, Anson County Schools Superintendent, 2018 SREC Superintendent of the Year! 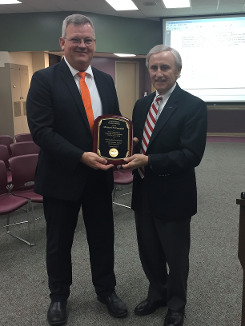 The award was presented at the August 28 Board of Education meeting by SREC Executive Director, Jim Simeon.